Run for Enda is just one of many fantastic events staged annually in memory of the 18-year-old who was mowed down and killed by a drunk driver just three weeks after he started university in October 2014. In the months after his devastating loss, Enda's dad Peter found an outlet for his grief through setting up a charity in memory of his son. 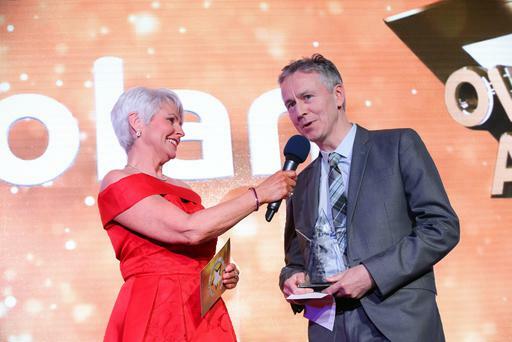 The positive impact which the Enda Dolan Foundation has had on the lives of thousands in his community of Killyclogher, outside Omagh, saw Peter pick up our Overcoming Adversity Award at the Sunday Life Spirit of Northern Ireland Awards with Specsavers in 2018. Peter, a chartered architect, said one of his proudest moments was when Enda decided to follow in his footsteps and was accepted to Queen's University to study architecture. He had just started the first term of his degree when he was hit by a drunken motorist who drove on for 800 metres with Enda on the roof of his vehicle. It was his sister Dervla's 16th birthday. He also has three younger brothers Ben, 16, Andrew, 12 and Adam, 10. Peter, 51, says he and his wife Niamh, 50, will never forget getting the knock on the door at 4.20am. "Our world changed when we got that knock on the door. "From then on things have changed drastically for us. Enda was a gifted young man who was very active and very bright. "He was a straight-A student and a very keen athlete who also enjoyed running. Our lives were turned upside down from that moment on." Finding purpose in giving back to his local community in tribute to his son has kept him going ever since. The Enda Dolan Foundation is a fitting legacy for Enda. There are three aspects to the foundation - health and fitness through running, a guitar summer school and a campaign for changes in the law to bring in tougher sentencing. The first which has impacted on thousands of lives is Peter's drive to help improve the health and wellbeing of people through various running programmes. Enda had been a keen athlete who enjoyed running and Peter, also a keen runner, created the 'Run for Enda' which has become an annual event attracting thousands each year. The training programmes are a chance for people who don't exercise to change the quality of their lives and hundreds have taken part. Peter says: "We are just coming to the end of our couch to 5km and half marathon training programmes and this year we had over 300 people taking part. They will now be aiming to run the Omagh half marathon and the 5km on April 6. "The running programmes are going really well. We also have a range of merchandise now with the Run for Enda logo and you see the hoodies and T-shirts everywhere. It is great to see it, it really does your heart good. " Enda was also a gifted guitar player and in honour his dad established the annual Red Balloon Guitar Workshop which is held for a week every August. Peter says:"We have about 20 volunteers and tutors who support us and it is a very uplifting week and very enjoyable. It's great to hear how the kids have come on." The third strand of the foundation is lobbying for a change in the law to secure tougher sentencing for people who cause death by dangerous driving. Their campaign has seen them meet with the Director of Public Prosecutions, the Attorney General and officials from the Department of Justice. It was launched after the devastation they felt at what they saw as the leniency of the sentence handed out to the man who killed Enda. David Lee Stewart, 31, who had consumed at least six pints and four Jagerbombs when he mounted the footpath and struck Enda, was initially jailed for just three-and-a-half years. He was also banned from driving for five years and ordered to spend another three-and-a-half years on licence after his release from prison. The family appealed the sentence and were left distraught when on appeal, he was ordered to spend just one more year in jail. Peter says:"We were devastated all over again. We had a lot of questions and difficulty getting answers. It is a disgrace and it is just not acceptable. "Currently the maximum sentence for causing death by dangerous driving is 14 years and we are campaigning to get that changed. "We believe it should be at least 20 years or life in prison. "We met with officials from the Department of Justice last August with some other families and put our case to them and we are now waiting on the sentencing review which hasn't happened yet because of the political situation at Stormont. "I would call on people of power to address it as soon as possible as every week that goes by sees someone else standing outside the court in despair over the legal system. It is important to get it resolved as soon as possible." Receiving the Spirit of Northern Ireland award was a bittersweet moment for Peter but he says it has been a great boost to the work of the foundation. He adds: "It lifted our profile and work and it has done us no harm at all to receive it. It was great."